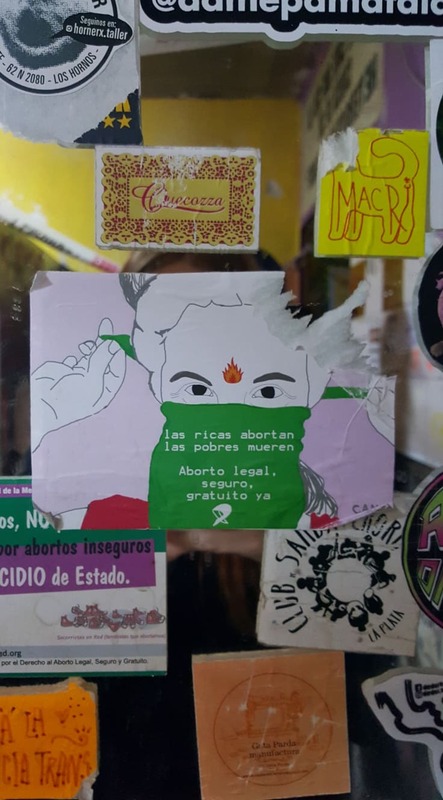 Now I am entering week three here in Argentina and I finally got in contact with some people involved in the struggle and the movement for the legalization of abortion about conducting interviews with them. So for this week I have scheduled three interviews, the first one tomorrow. The nerves are a bit shaky but it will hopefully be fine. Tomorrow I will conduct an interview with a women involved in the “National Campaign for the legalization of abortion” (La campaña nacional por el aborto legal seguro y gratuito) and then later during the week I have two interviews with two medicine students who are organizing an open and free course at the medicin faculty about abortion and it being a problem of public health care. 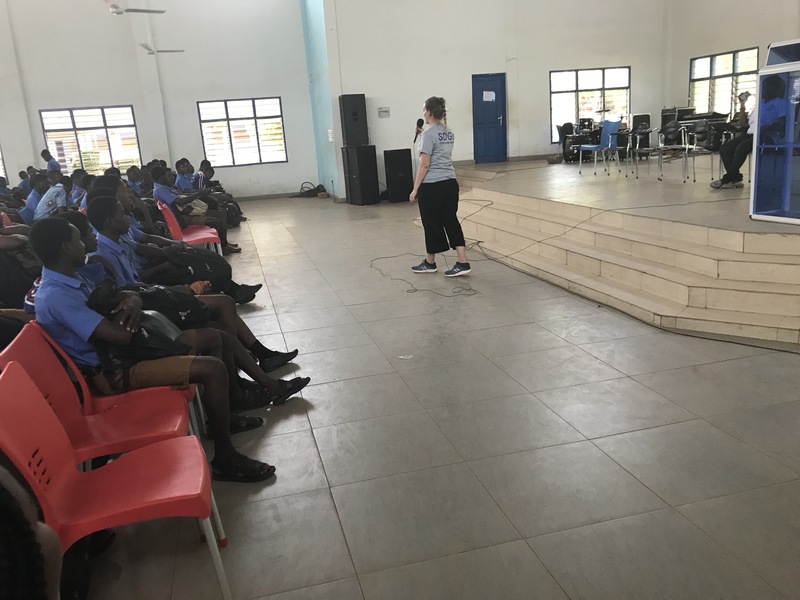 Since the practice of abortion is illegal the medicin students does not get trained in how to address the issue of abortion and how to talk about it. The organizers of the course states that the purpose of the course is to provide academic and practical tools that are needed in order to confront the reality, a reality where where people that are able to get pregnant do have abortions . 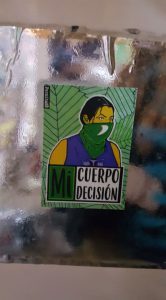 The penalization of the practice imply that women realize abortion in unsafe and clandestine manner, which makes it a problem of public health care. I believe that it is an important aspect and action in the struggle for the legalization to also provide professionals with the tools they need in order to help women. During the weekend I had time to enjoy some fiesta. 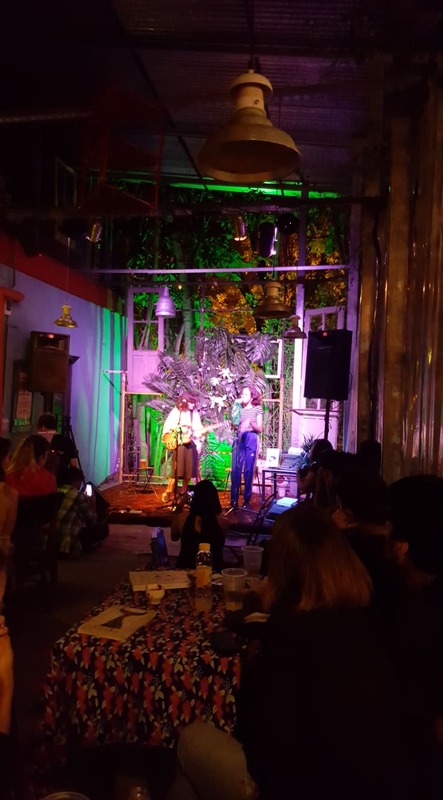 A cultural center in the city had a LGBTQ festival that where arranging performances and concerts that raised awareness to the trans and non binary artist scene. It was really fun and so nice and open energy at the place. It makes me glad that there are places like this where everyone is welcomed and the hegemonic way of understanding gender is challenged and deconstructed. During Sunday evening I went to a book release event. A student from the journalist faculty presented her book “Seremos Ley” that is a result from her bachelor thesis. The book presents various stories from the women engaged in the movement for the legalization of abortion and especially women engaged in the “socorrismo”. 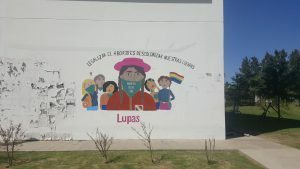 Las socorristas is a group of women that help and accompany persons that wish to have an abortion in the process, so that they are able to have a safe and abortion. 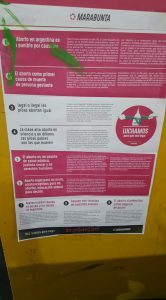 This national network of help or first aid, which is the translation of socorrismo into english, has become extremely important to the struggle for legalizing abortion. Every year this network help and accompany around 5,000 women to have safe abortions. 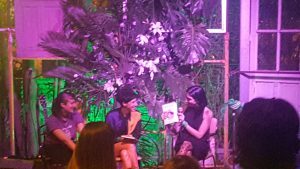 During the event there were some beautiful live music but also a discussion talk and presentation of the book by the author. Women who had been interviewed for the book where also there and together they presented a interesting discussion of the their work and its importance for the struggle. 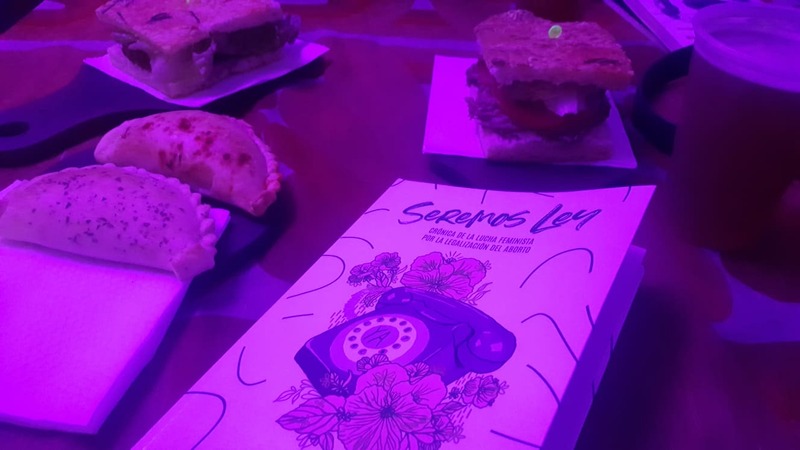 The book Seremos Ley which in English means “we will be ley”. 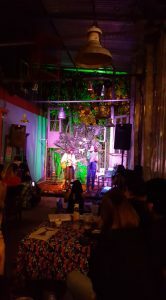 Picture of the talk where the author presented her book and then some live music. The call for abortion can be found in many different places, for example in the bathroom of the place where they held the party, there I found these stickers. Hello from a new week in Ghana! 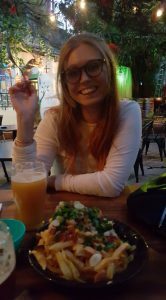 I thought I would share some things that I have noticed so far after my 3 weeks here, that are quite different from Sweden. Most of them positive, some a little less. The traffic here is CRAZY compared to Sweden. Everyone drives like crazy, honking to everything and nothing, and I wouldn’t say traffic rules are what decides how people drive. I’m taking both Uber, but also the local ‘bus’ called trotro which is the cheapest option. It is all the same, you kinda feel happy you are still alive when you get out of the vehicle haha! It is definitely true what they say, if you can drive in Accra you can drive anywhere in the world! People are so friendly and welcoming. Maybe sometimes a bit too much for a European… I love the fact that everyone talks to everyone, every house is open to everyone, people sit outside and talk and just spend time with each other. It is a whole different culture in that sense compared to Sweden, where most people just want to stay in their own corner and spend as little time as possible with strangers or interacting face to face. But the downside might be when the Uber driver says he loves you and asks to marry you after 5 minutes in the car. It happened to my roommate from Germany, it seems like she handled it well whereas I’m thinking I would’ve either freaked out and jumped out of the moving car or gotten quite angry… Neither which would be a very good solution haha, so I am happy she told me about this so that I’m prepared with a chill answer if it would happen to me. + always sit in the backseat, less risk for it to happen! Obruni – white man. This is the main word Ghanaians use to get my attention on the street. At first, I found it to be a bit strange and felt uncomfortable, but after discussing it with some Ghanaian friends I’ve understood that it is not an insult or a bad word per se. As I connected it to be, like if someone would call black man after a Ghanaian on the streets in Sweden – we all know what would happen then. Goats, chickens, lizards, cockroaches, (huge) spiders and dogs are everywhere. In our yard by the house some chickens from the houses around daily come for a stroll, it freaked me out at first but now I kinda like it! Regarding the spiders, I killed one my first week here, but now I have named the one in my room because I consider him my roommate! Can’t say for sure if I like having him there just because, or if it is because seeing him in his usual spot calms me knowing that at least then he is not in my bed! 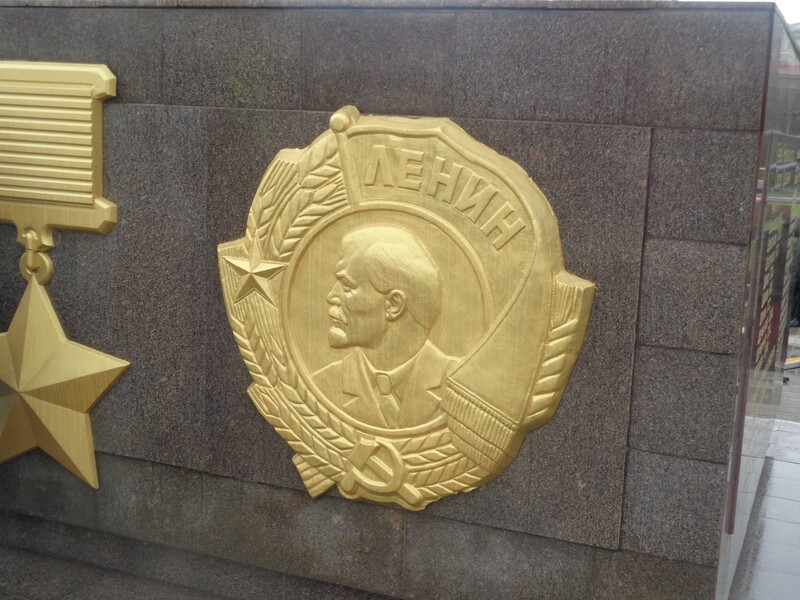 This week I conducted quite a lot of interviews with people who enrolled voluntarily to various military battalions. We talked about their motivations for voluntary enrollment, as well as their experiences in both civilian and combat zone. Moreover, I met and interviewed the friends and mothers of fallen soldiers. This helped me to get a better insight into the motivations of volunteer fighters. I have to say that these meetings were very emotional, and especially the interviews with the mothers of fallen soldiers were very difficult to conduct. The stories that they told me were very tragic and sensitive. It was very difficult to hold tears during some of the interviews. I was invited to the environmental event by some volunteer fighters. The purpose of this long planned project was to plant trees in commemoration of fallen soldiers. 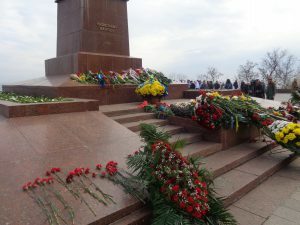 The event took place in the Maksim Gorkiy park, in Odessa. 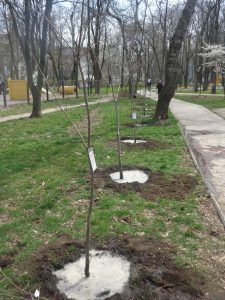 After the planting of trees was completed, the participants of this event mingled and enjoyed drinking tea with some Ukrainian sweeties. During this mingle, I was acquainted with more volunteers, as well as their friends and relatives. Consequently, thanks to these contacts my schedule is full with planned meetings for the upcoming weeks. I will conduct more interviews with volunteer fighters, and even participate in a celebration event. 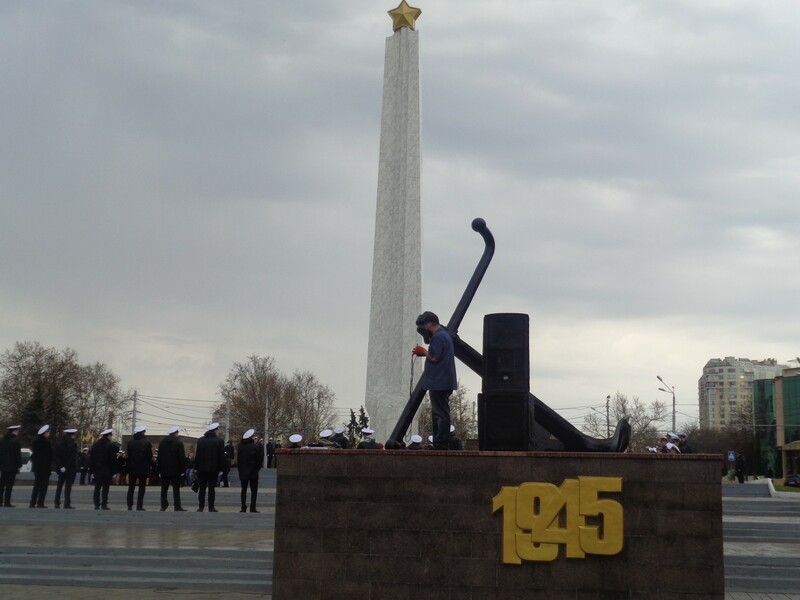 The tenth of April some residents of Odessa were celebrating the 75th anniversary since the liberation of the city from German occupation. 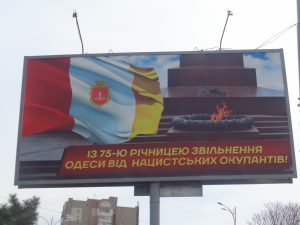 To my surprise, the city administration of Odessa and some governmental structures supported the organizers of this event. However, this event was not welcomed by all residents of the city having in mind the Soviet nostalgia evoked by this commemoration. On this day, the police was mobilized in great numbers to prevent violent actions. 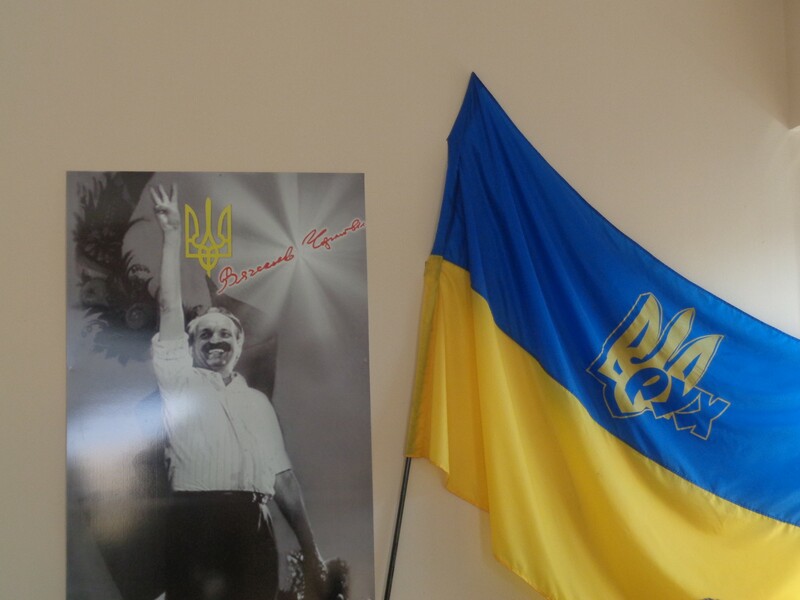 I was also invited to Rukh’s office in Odessa by the former volunteer fighter who works there. Rukh is people’s movement and a political party that mostly attracts Ukrainian nationalists. I have met many Ukrainian volunteer combatants who support right wing political movements and parties. However, it is important to mention that these nationalists differ from those in Western Europe and Scandinavia. 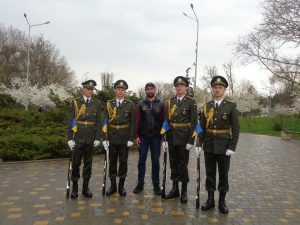 My encounter with Ukrainian nationalists was always nice, and at least out of my experience, I can conclude that these people express civic nationalism rather than ethnic. 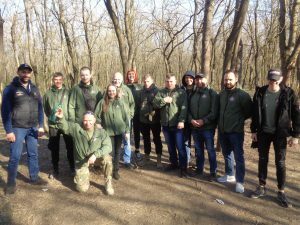 I would call these Ukrainians passionate patriots and not radical far right nationalists as some call them in various media outlets. These are people who love their country. 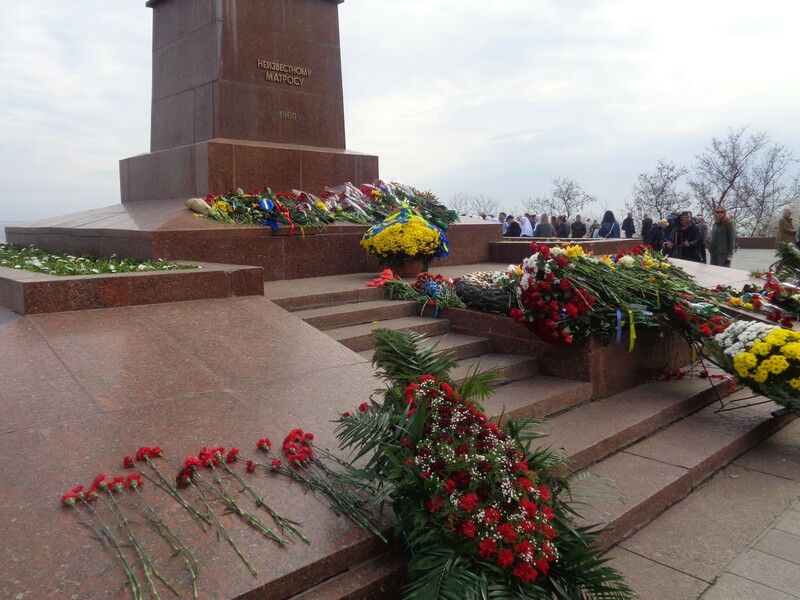 They welcome all ethnicities who respect the sovereignty of Ukraine. 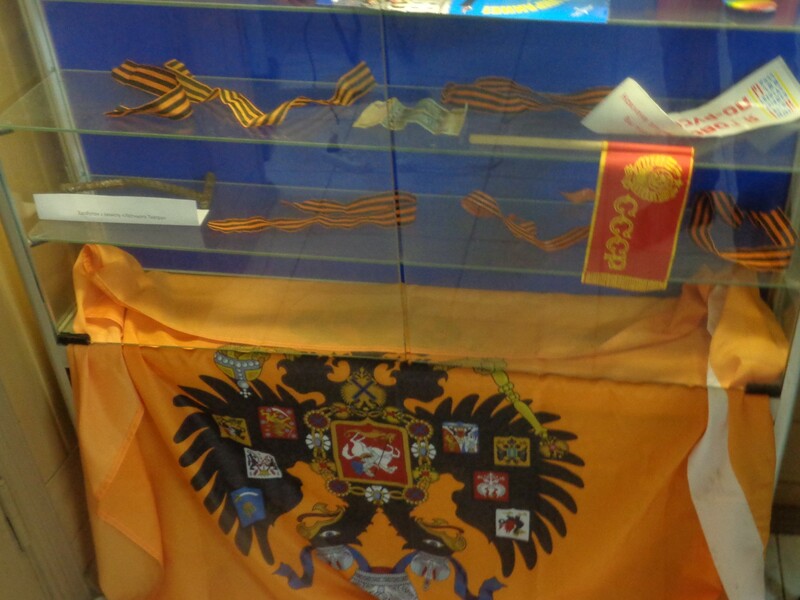 This was all from the city of Odessa. See ya next week! 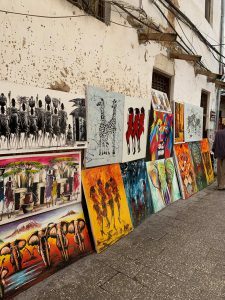 It’s safe to say that during two months in Zanzibar, I’ve experienced some very unfortunate situations. Everything from getting robbed and injured to getting typhoid fever my last two weeks. But nonetheless, I’ve enjoyed this time to the fullest and wouldn’t change it for anything in the world. For me, this MFS has been both a personal journey as well as it has benefitted my studies and given me an incredible eye-opener to a whole different culture. 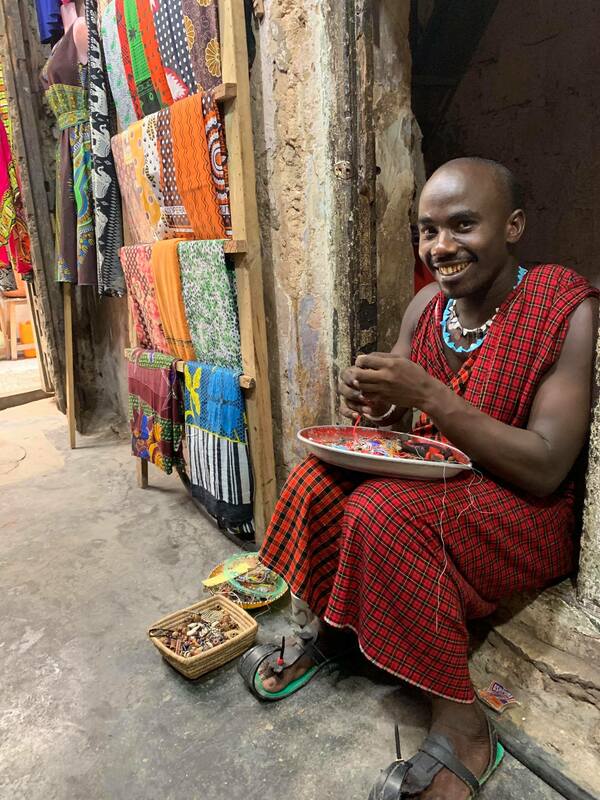 I’ve made friends from all over the world, learned some Kiswahili, lived 5 minutes from the most beautiful sea and in the heart of a UNESCO heritage city. Most valuable of all, I’ve gotten to collect data on one of the most interesting places in the world. I now have 8 weeks of observations and several interviews done, which I concluded in the last week. To be honest, studying colorism has been a bit tricky, something I knew would be a difficult topic to discuss from the get-go. In many cultures, it’s not common to speak about the discriminatory practice and it is not viewed as a form of internalised racism. Approaching people with my subject has therefore been a challenge as many people were of the idea that it’s simply evident that being of lighter skin is better and more beautiful. I’ve discovered that colorism, in fact, does affect women in various ways, be it in unconscious or conscious. Some of my interviewees witnessed being teased in school for the color of their skin, received nicknames based on their skin complexion and overall, described that women with lighter skin color have it much easier in several settings. 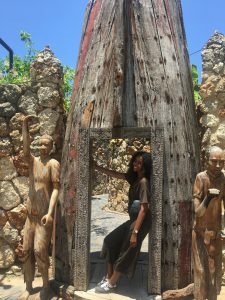 At the same time, I learned that the revolution in Zanzibar and the unity of the people has, according to my observations and my interviews, led to colorism not being as palpable on the island archipelago as on the mainland of Tanzania. I’m thankful for SIDA for giving me this opportunity and in general, thankful that I live in a country that has the means to be able to provide young generations with this type of life-changing experiences. I’m thankful for all the friendships I made, my interviewees who so kindly offered me their time , the staff at SUZA who not only taught me swahili but also helped me understand the culture of Zanzibar and assisted me with knowledge and help in all my endeavors. My journey ends here for now, but I will definitely be back soon. 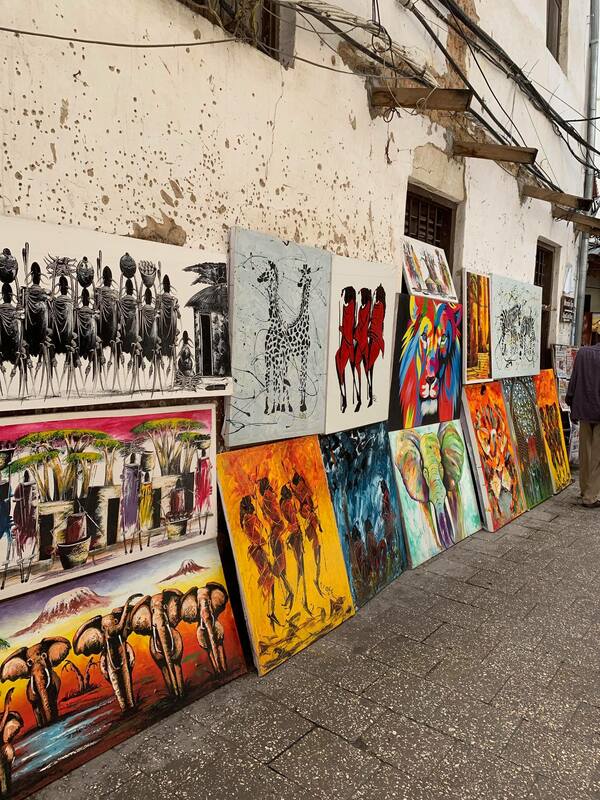 Asante sana Zanzibar, you have changed me forever. 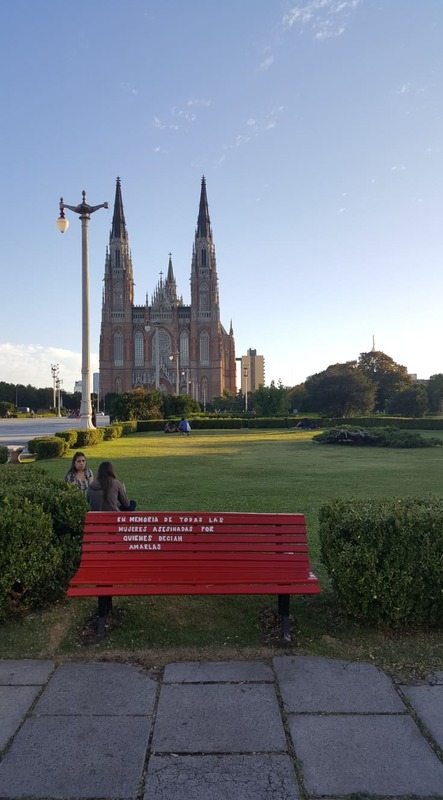 I have now entered my second week in Argentina and things are going good. Last week I was reading the literature my contact person gave me and it gave me some new insights and ideas for my interviews. So everyday last week I biked to the humanities faculty and studied in the library as the good student I am 😉 Now I feel a bit more confident on the current academic discussion on the issue of abortion and this is good knowledge for both the writing of the thesis and the interviews. Yesterday I meet with my contact person again and I showed her my interview questions. She gave me some really useful help in formulating the questions in Spanish, since Spanish not my mother language I sometimes need help with the translation. Now it is time to contact the women for my interviews. My contact person has given me some contacts that I am now getting in touch with. One of them lives in the south of Argentina so hopefully a trip will be organized to the beautiful south. Besides studying I have had time to enjoy the weekend with some friends. 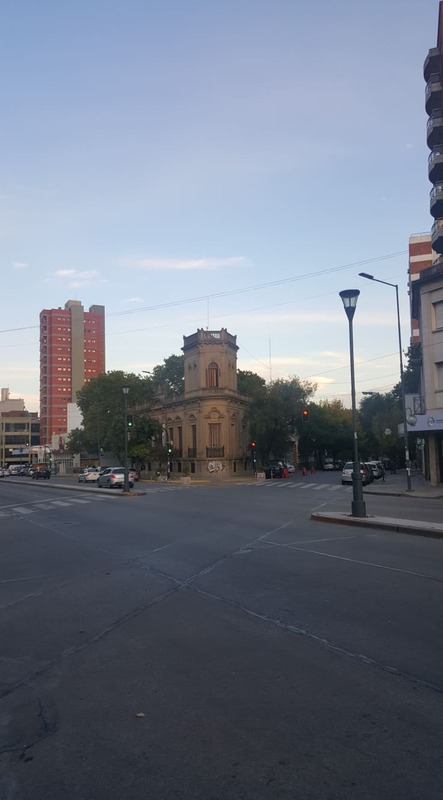 The plan for Friday was to go see a theater because it “La noche de los teatros” (the night of theater) and all the theater plays were free. After visiting three different theaters and all of them were full we decided to go to a bar instead. Saturday night continued in a cultural vibe when I went to the cinema with a friend to see a feminist movie from the 70’s. The movie was centered around the abortion struggle and the idea of motherhood in France during that period and it was so really mind opening to see that these are themes that we are still discussing in modern times in both Sweden and especially here in Argentina. 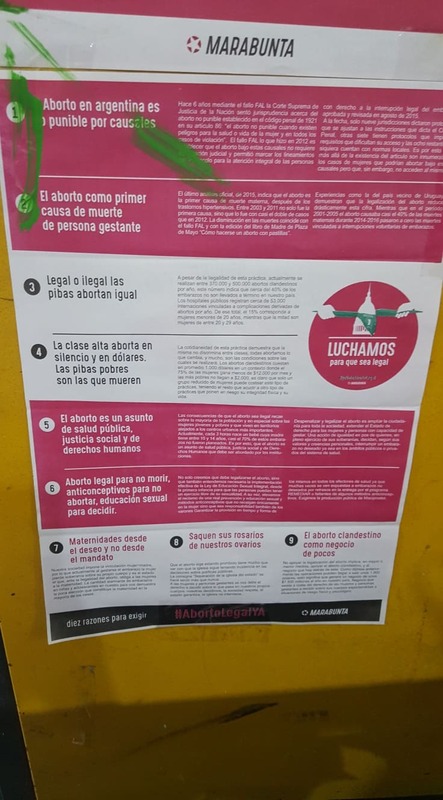 This is a poster that I found at the faculty, 9 reasons (because unfortunately number 10 was not captured in the foto) for demanding legal abortion in Argentina. They are all reasons that illuminate the current discussing of abortin in the country and the social affects it has, and i thought it could be relevant to show here on the blog. 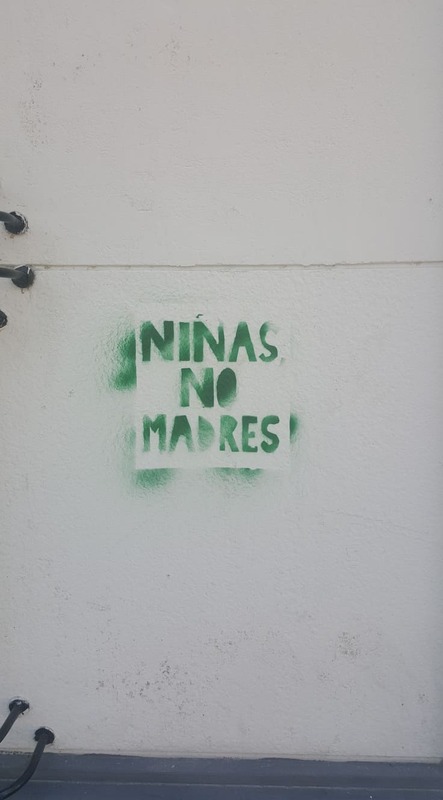 Abortion in Argentina is non-punishable in some causes. Abortion is the leading cause of death for pregnant women. Legal or illegal, women will have an abortion either way. The upper class abort in silence and in dollars. The poor girls are the ones that dies. Abortion is an issue of public health care, social justice and human rights. Legal abortion for not to die, contraceptives for not having to abort, sexual education for deciding. Motherhood from the desire not from an order. Take away their rosary (catholic prayer beads) from our ovaries. Clandestine abortion as a business of few. A painting on the faculty building that is demanding the access to legal abortion as a decolonization of women’s bodies. Finishing this post with a less important picture of me eating Argentinian fires, the best ones with cheese, onion and bacon. 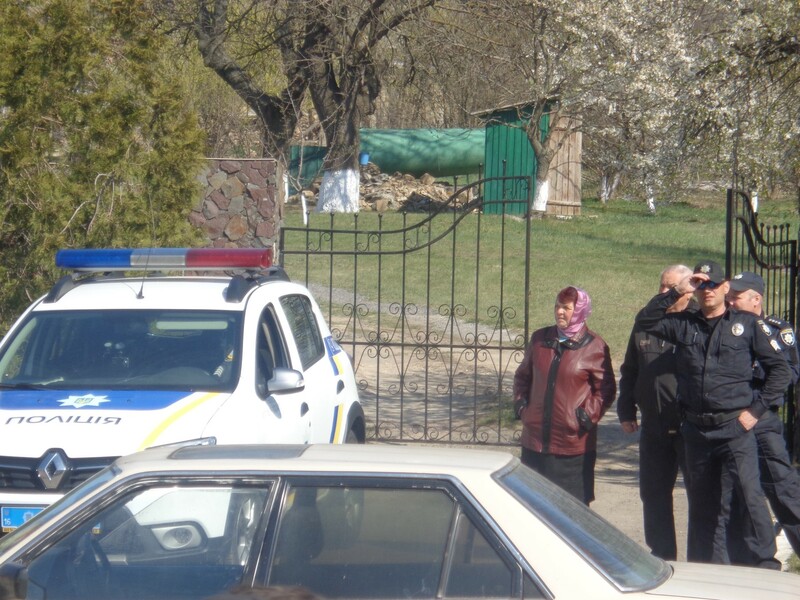 Another week in Ukraine came to an end. 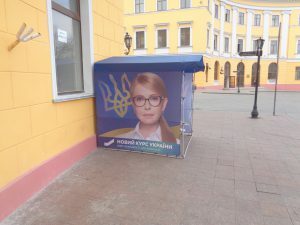 A week ago approximately 30% of Ukrainians voted for a comedian Volodymyr Zelensky. 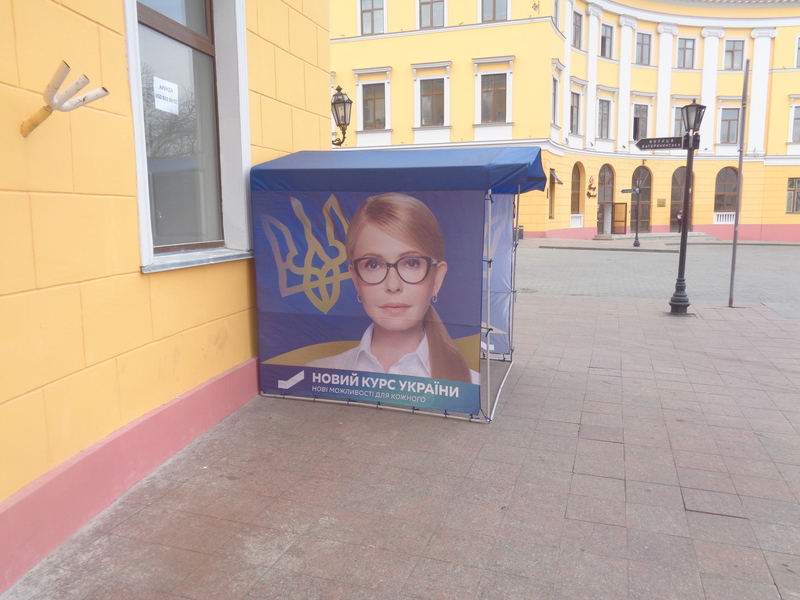 Most of my Ukrainian acquaintances here said to me that they voted for Zelensky. They believe that the elections were conducted transparent and democratic. I have also met some people who think that it is not the right time for Ukraine to play democracy during the ongoing crisis. 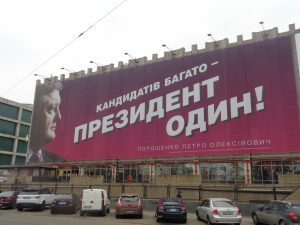 Therefore, they support the current “conservative” president Petro Poroshenko who will compete with Zelensky for the presidency. The second round of the elections will be held by the end of the April. Meanwhile, Poroshenko and Zelensky will engage in debates to win the minds and hearts of their voters. This week I became acquainted with the Right Sector’s activities more closely. 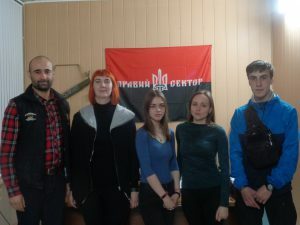 I met some key individuals within the organization and had an interesting conversation about the motivations of volunteer fighters. I met people who have recently returned from the frontline, but also with those who plan to depart soon. Two interviews were conducted this week. A lot more interviews are planned for the uppcoming weeks. I make use of the snowball sampling technique and I strongly recommend it to everyone who use interviews as the data collection method. With the help of snowball technique I am constantly introduced to new people thanks to the social network of my research participants. Although I have arranged many meetings for the next week, the saturation point seems to be far away . So, to answer my research question I will need to get multiple insights on the phenomenon of voluntary enrollment in military battalions. 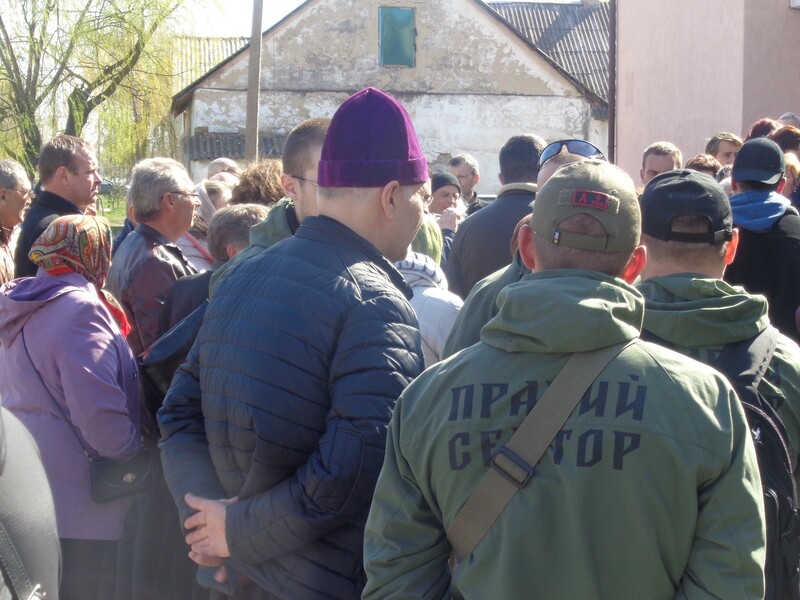 I have also engaged in the activities of the Right Sector and made my first participant observation in the field. 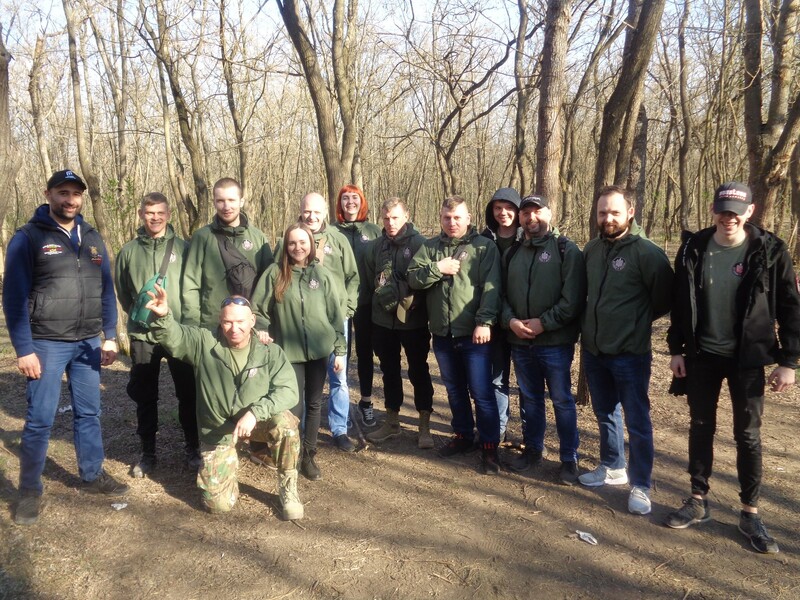 The Right Sector plays an active role not only in the conflict zone, but also in somewhat relatively peaceful settings of the everyday life. For instance, I followed with the members of the organization to Bessarabia in South Ukraine, close to the Moldavian and Romanian border. This trip played a preventive role and counteracted the attempt of a certain church to be incorporated into the Moscow Patriarchate. 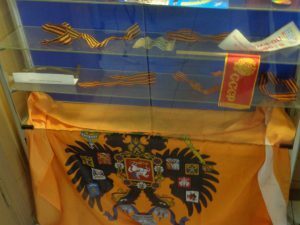 There is an ongoing competition and tension between the Moscow and Kiev Patriarchates. 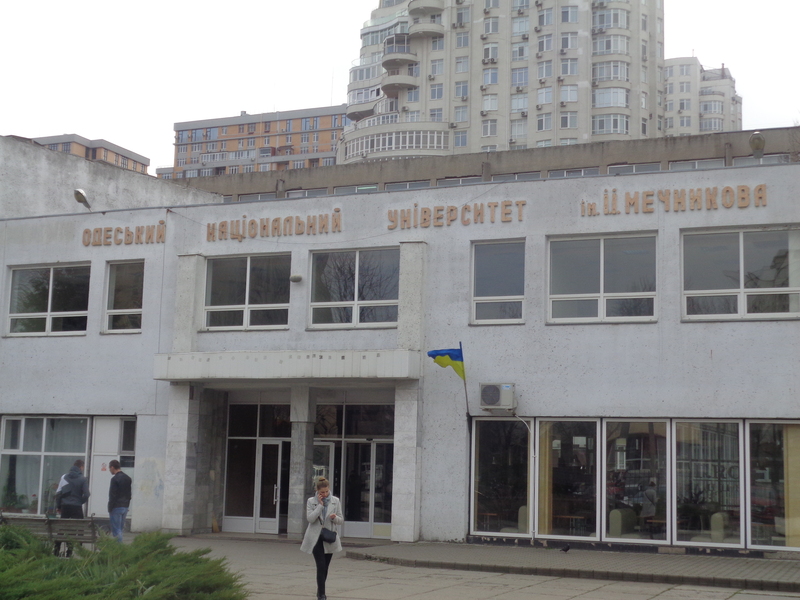 Both compete for the control of the churches located on the Ukrainian territory. 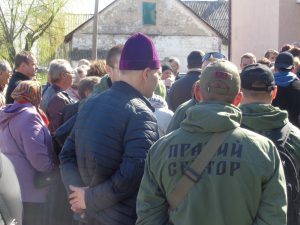 According to some members of the Right Sector, churches that belong to Moscow Patriarchate take their orders from Russia and frequently engage in conspiracy to undermine Ukrainian sovereignty. 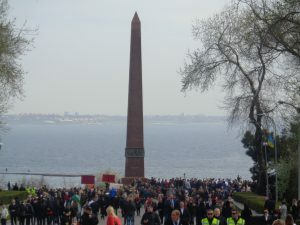 Consequently, this trip was aimed to impede the possible conversion of a particular church to the Moscow Patriarchate. Fortunately, everything went without violence, though similar events in the past usually resulted in unpleasant incidents. Later on we had a lovely picnic in the forests of Bessarabia where everyone mingled. During this mingle I was introduced to some former volunteer militias whom I plan to meet and interview next week. 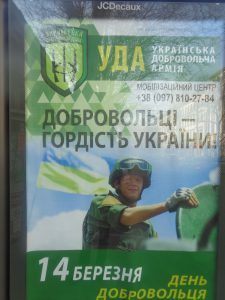 Lastly, I would like to mention about the politicized and militarized stand posters that can be encountered in the streets of Odessa. 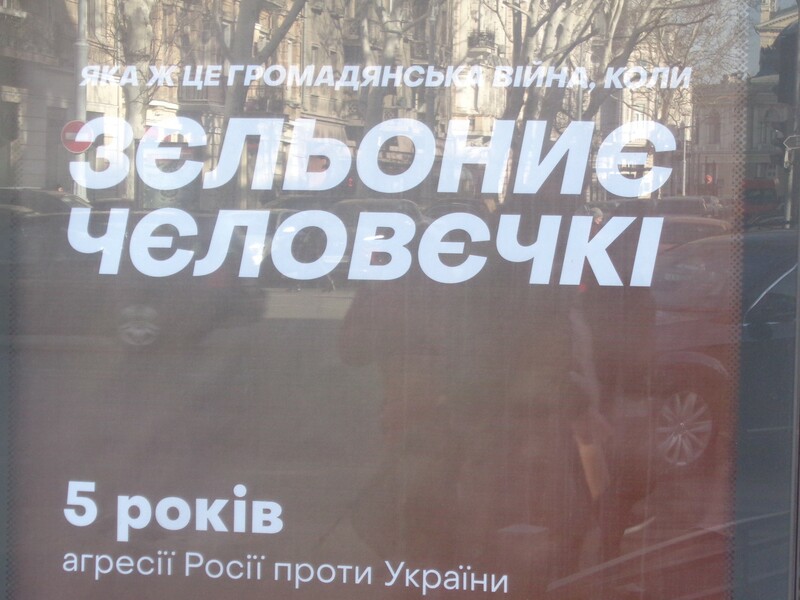 These posters carry agitational character and express ideological aspects of the confrontation between pro-Russian and pro-Ukrainian exhortations. The frequently encountered slogans remind people about the Russian agression, while other posters inspire for voluntary military enrollment. There are also posters that glorify the actions of the Soviet Union during the World War Two, especially the victory over the so called “Fascist” occupation. 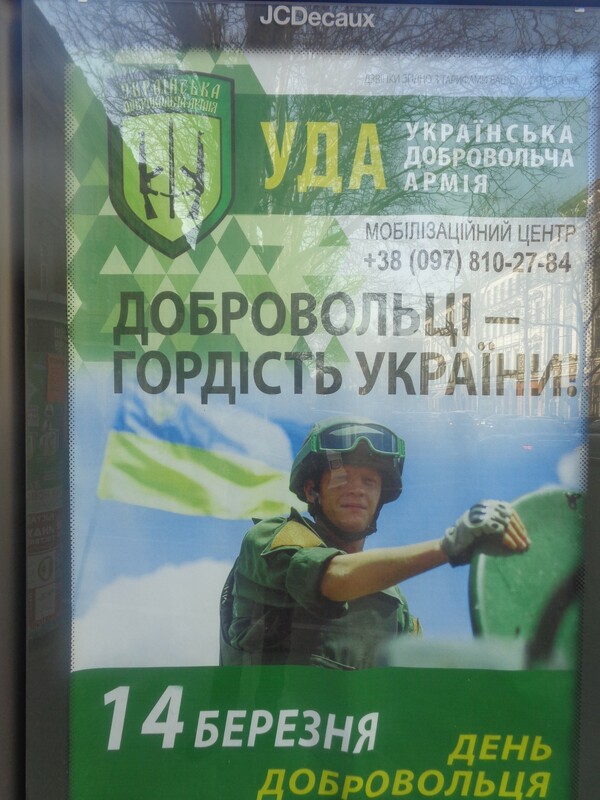 Despite these conspiratorial posters, the Ukrainian people live with the hope for a peaceful future. It was all for this week and I will be back with more stories next week! Finally I have arrived to Argentina and this new experience has begun. 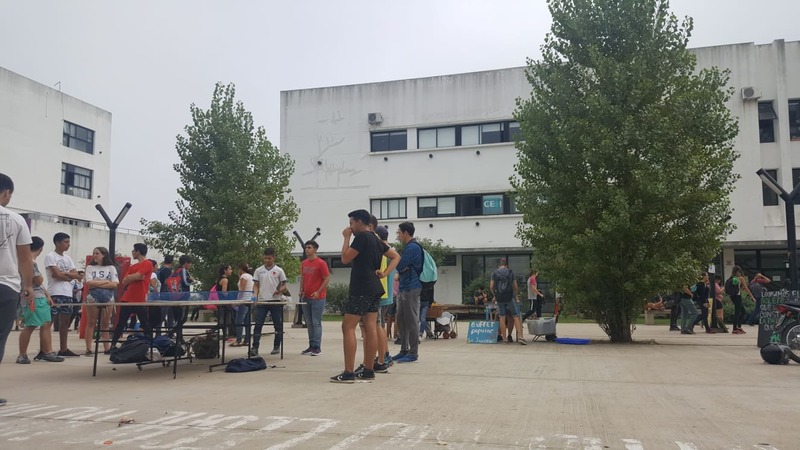 I have decided to stay in La Plata, a student city one hour outside of Buenos Aires, where I did my exchange semester last year. 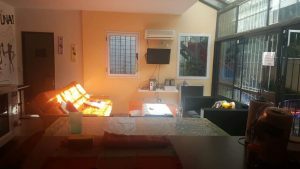 I have found a wonderful little accommodation with a patio that I share with two other students. 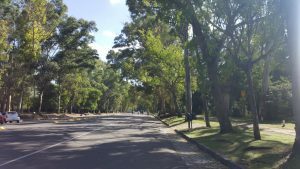 My plan is to have La Plata as a “home base” and then travel to places in the Buenos Aires region when I need to conduct interviews. On Monday I meet with my contact person who is a teacher at the Humanities faculty here in La Plata and we had a great first meeting together. We talked a bit about my project and she gave me some literature so that I can read up on the the current discussion of abortion in the country. During my exchange I learned a lot about the women’s movement and the political debate of abortion and now I am excited to learn even more and to gain new experiences. The first days have been intense and filled with studying but I have also had time for some catching up with missed friends from my exchange. The weather is better than I expected so I am walking around and enjoying the sun. It feels like things haven’t changed since I left Argentina almost one year ago. 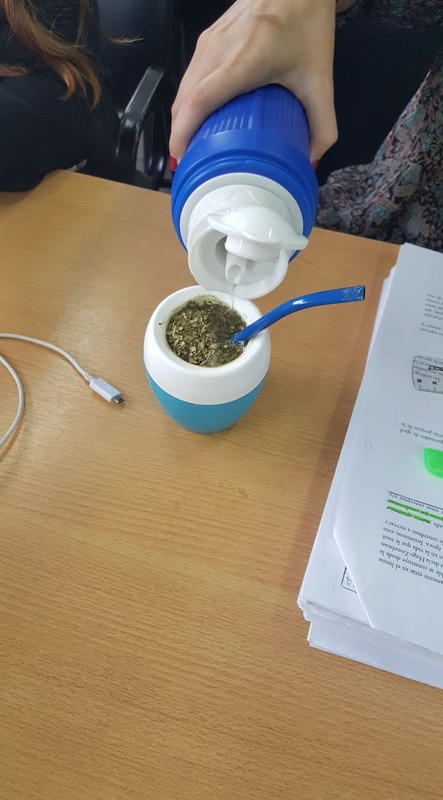 The people are as friendly as always and they don’t miss a chance to sit down and drink some mate (the argentinian national drink). 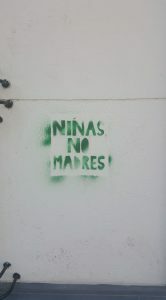 But there is one drastic change in the country, the economic crisis. The argentinian peso has lost half of its value in one year and the prices have increased due to the current inflation. The crisis is affecting all the areas and spheres of the lives of population, and persons have shared their discomfort and preoccupation on the current situation. During the week I will continue reading and start to formulate the questions for my interviews. Hopefully I will have some time during the weekend to enjoy some cervezas and perhaps even a concert. The rhythm of life is relaxed and and plans happens in the moment, something that can be a bit different from the Swedish way of planing, but I like it. 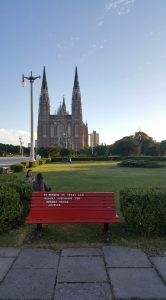 The catedral of La Plata and a red painted bench commemorating women who died due to domestic violence. 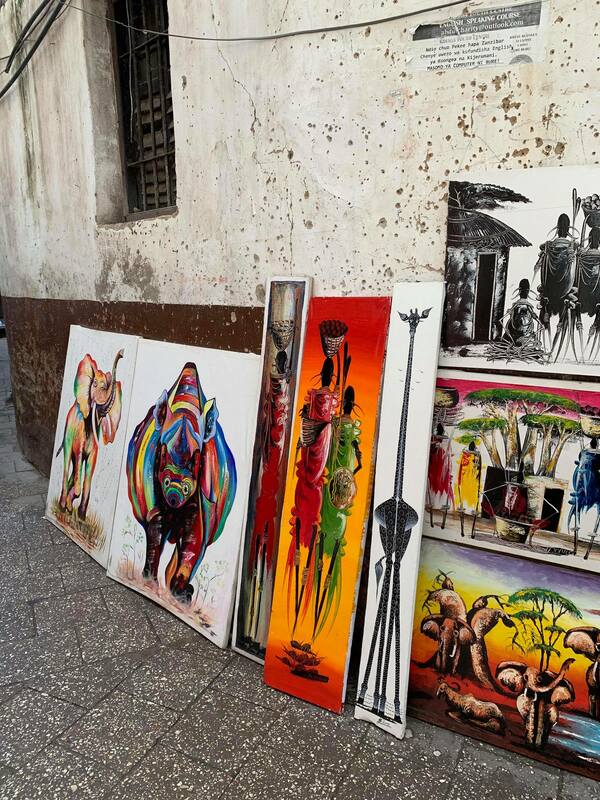 My stay here in Stone Town is almost coming to an end. 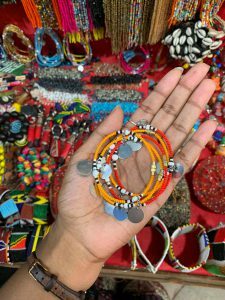 Having spent more than seven weeks here, I’ve reflected a bit surrounding gender equality, prejudice and preconceived notions about Africa and developing countries in general. Before coming here, I, like perhaps many others, assumed that I would be going to a country where gender inequality was highly prevalent. 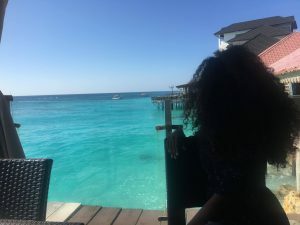 I spent a lot of time thinking of how I would respond if somebody questioned why I travel alone as a female, why I’m not yet married or have any children etc. I also mentally prepared for the eventuality of males trying to hush me down, ignore my thoughts and undermine my ability as a woman and, worst case scenario, how I would behave when experiencing sexism or harassment without jeopardizing my own safety. I believe these thoughts have developed because of a narrative that has always been presented to me about developing countries and how they are far behind when it comes to gender equality and how the Western world is advanced in this area. Instead, my prejudices have been challenged and many times, gotten a big slap in the face. 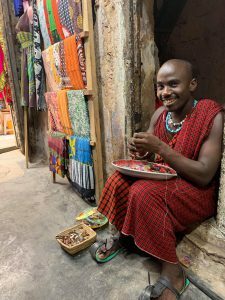 In the second week of being here, I had a conversation with my Swahili teacher (who is a male) about gender inequality. We started talking about the subject when he told me about something interesting he had come to find out somewhere, which he found shocking and disturbing. He told me that he had heard that over in the US, women with the same education and work experience as their male counterparts were not receiving the same salaries as the men. I still remember his surprised reaction when I explained to him that this unfortunately, is the case for many other countries, including countries in Europe. He went on to say that it would be impossible for that to happen here in Zanzibar and even illegal. We later continued on having a long discussion about gender inequality and how it manifests itself differently depending on the country. 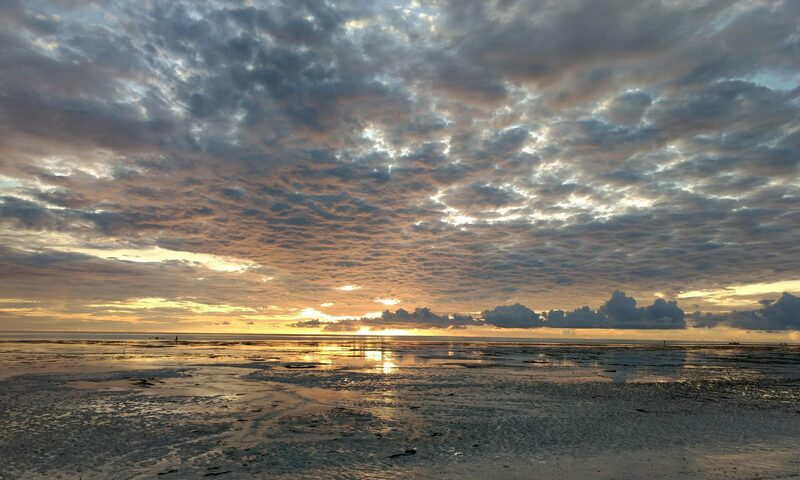 Now, I am no expert in Tanzanian/Zanzibari policies and regulations, nor am I saying that Zanzibar is without flaws, because that’s far away from the truth. But one thing I do know is that ever since I came here I’ve seen women in top leading positions, giving out assignments and orders to their male colleagues and employees. Something I honestly did not think I would witness prior to coming here. The head dean at my university is a woman, several of the people in charge that I met at different ministries and institutions while applying for a research permit, have been women. I’ve seen a majority of female doctors at hospitals, many of the police officers I’ve met have been women and, even in my hostel where I am currently living, there is gender parity in housekeeping, reception and in the restaurant. I say all this to say, that in a developing country that is predominantly Muslim, I have witnessed a gender parity and a sense of equality that I would not have expected before coming here. I also believe, that my own country of Sweden who prides itself in being the first feminist government in the world, has a lot of inspiration to draw from this small island off the coast of East Africa.